To study the short-term effect of corticosteroid injection on temporomandibular joint structures. Thirty-six female adult Wistar albino rats divided into three groups according to the number of corticosteroid injection, each group has two subgroups according to the time of scarification either after one week or two weeks after the last injection. The most affected structure of the temporomandibular joint is condylar head and temporal bone, followed by hyaline cartilage and the fibrous layer. The articular disc and retro-discal tissue are the last structure to be affected with intra-articular corticosteroid injection. Single corticosteroid injection with the recommended dose is safe. Single corticosteroid injection was safe with the return of joint structures to its normal cellular structure after two weeks. Double injection with six weeks apart resulted in irreversible damage to the components of the joint. Three injections with six weeks apart resulted in massive destruction to most of the temporomandibular joint structures. The major components of the temporomandibular joint (TMJ) include; the mandibular condyle, the articular disc, the glenoid fossa, and the articular eminence of the temporal bone, unlike most joints, the articulating surfaces are ﬁbrous and not cartilaginous . The most common degenerative joint disease affecting the TMJ is osteoarthritis which reflects the inflammatory changes that may take place in the joint . The pathological process of TMJ arthritis is characterized by deterioration abrasion and derangement of articular cartilage with local thickening. These changes are frequently accompanied by the superimposition of secondary inflammatory changes . Treatment design based mainly to reduce inflammation; however, sometimes more comprehensive treatments are required. Management of TMJ-osteoarthrosis may be divided into noninvasive, minimally invasive, and invasive surgical modalities. Finally, in end-stage disease, salvage modalities must be considered . Local intra-articular injections of different corticosteroids are tried for treatment of joint arthritis, synovitis, bursitis, epicondylitis, tendonitis. Intracapsular injection of glucocorticoids in the temporomandibular joint has been reported to decrease pain in patients with both pain and limited mouth opening secondary to inflammatory disorders of the joint, resulted from arthritis and or capsulitis . The management goals in the treatment of painful TMJ arthritis are; decreasing joint pain, swelling, and masticatory muscle spasm for preventing further joint damage and disability . Inflammation is reduced, particularly through reductions in the release of interleukin-1, leukotrienes, and prostaglandins. With the reduction of these inflammatory mediators, pain symptoms often are improved. Corticosteroids inhibit cell proliferation and induced cell apoptosis [programmed cell death]. The mechanism by which corticosteroids does this is most likely through blocking the anti-apoptotic effects of Insulin-like growth factor (ILGF-1) . Because they are injected locally, intra-articular steroids avoid most of the systemic effects of oral steroids . Studies of the efficacy of intra-articular TMJ injections have shown mixed results, with improvement in some patients and disease progression in others [7,8]. Regarding the effect of intra-articular corticosteroid injections, a study showed significant deleterious effects on articular cartilage after only one steroid injection into the knee, furthermore, the authors also found that the higher the dose of steroids injected, the worse the deterioration . Even one injection into the temporomandibular joint (TMJ) showed the tremendous destruction of the articular disk and underlying bone, even 16 weeks after a single steroid injection, the joint structure remained biochemically and metabolically impaired . A study examined the articular cartilage of the TMJ after two injections with triamcinolone revealed higher destruction to all layers of the joints that received when compared to the joints which received no steroid injections . High doses of corticosteroids are known to increase the risk of aseptic bone necrosis. Repeated, high doses of intra-articular corticosteroid resulting in joint degeneration . The most common treatment strategy is either a single injection  or a series of two injections spaced 14 days apart . Although the best method has yet to be determined. Some clinicians have suggested that a single corticosteroid injection is beneficial for patients with severe TMJ pain, while further injections do not provide added pain relief, and may increase the risk of joint degeneration and other complications [12,15]. Animal models are a useful tool for understanding the pathophysiological mechanisms underlying TMJ disorders, and for evaluating the efficacy of intra-articular injections including adverse effects . Until now the number of intra-articular injections of corticosteroid agent that required controlling the disease with the long-term outcome with patient satisfaction undefined [17,18]. Thirty-six adult Wistar albino not pregnant female rats with weight ranged between 150-200 gm were selected from the animal house in the faculty of medicine, Cairo University and included in the current study. The rats were fed dried vegetables and the light cycle ratio 10:14 hours (light to dark respectively). The drugs used for anesthesia were: Xylaject 10 mg/kg [Xylaject: Adwia Pharmaceuticals Co.] plus ketamine 10 mg/kg [Ketamine: Sigma-Aldrich Co.] through intra-peritoneal injection. The rats were divided into three main groups: A, B, and C. Every group is subdivided into two sub-groups. Each sub-group had six rats; as follows. All rats of the group were injected with single depo Medrol dose through intra-articular route; the sub-group A1 [n = 6] were sacrificed one week after injection. The sub-group A2 [n = 6] were sacrificed two weeks after injection. All rats of the group were injected twice at (0, 6) weeks; the sub-group B1 [n = 6] were sacrificed one week after the second injection. The sub-group B2 [n = 6] were sacrificed two weeks after the second injection. All rats of the group were injected three times at (0, 6, and 12) weeks; the sub-group C1 [n = 6] were sacrificed after one week after the last injection. The sub-group C2 [n = 6] were sacrificed two weeks after the last injection. Left temporomandibular joints were the target for injection of corticosteroid while the right joint act as a control. The joint felt 5-10 mm posterior to the lateral canthus of the eye while the mandible was manipulated to provide movement of the condyle for a further positive identification of the joint. Local hair of all rats were shaved at the areas of injection followed by scrubbing with betadine [Betadine povidone-iodine. The Nile co. for pharmaceuticals and chemicals industries-Cairo-A.R.E]. The needle was then inserted from a posterosuperior direction until the mandibular condyle was felt. Once the needle was inside the joint, a 0.5 ml of the corticosteroid injectable suspension [depo Medrol Methylprednisolone acetate, Pharmacia & Upjohn co. division of Pfizer Inc New York. NY10017], diluted in saline with 1:4 ratio [~4 mg of the active drug] was injected slowly. At the time of sacrification according to the group the animals were sacrificed by an overdose of anesthesia. The TMJ was dissected and immersed in 10% formalin at least 24 hours then washed under running tap water for 15 min and then decalcified in formic acid 20%. After decalcification, and softening; the specimen washed under running tap water for 2-3 hours then dried. Serial alcohol preparations 50% then 70% then 90% then 95% then 100% then immersed in xylene, after that the specimen immersed in liquid paraffin at 60 ℃ to form blocks. 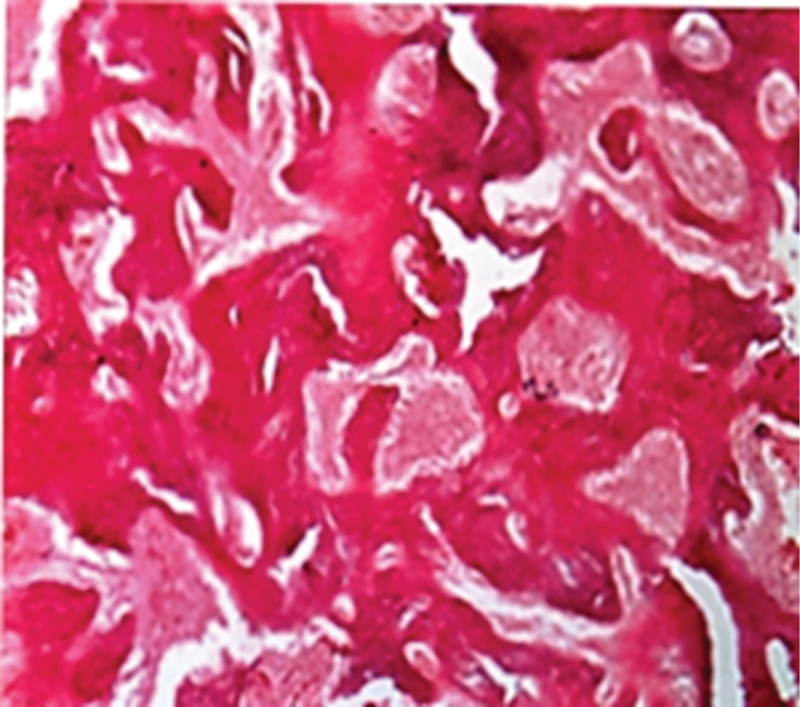 Serial sections 4 µm in thickness were made and stained with Haematoxylin and Eosin (H&E) for histological examination. The left injected joints compared with right one. Bone marrow spaces are slightly wider at the area of condyle head surface near the joint space in five animals [n = 5], and one joint condyle showed moderate widening [n = 1]. Regarding the fibrous layer that covering the condylar head, hyaline cartilage, the temporal bone, and the articular disc appear normal in four animals [n = 4]. 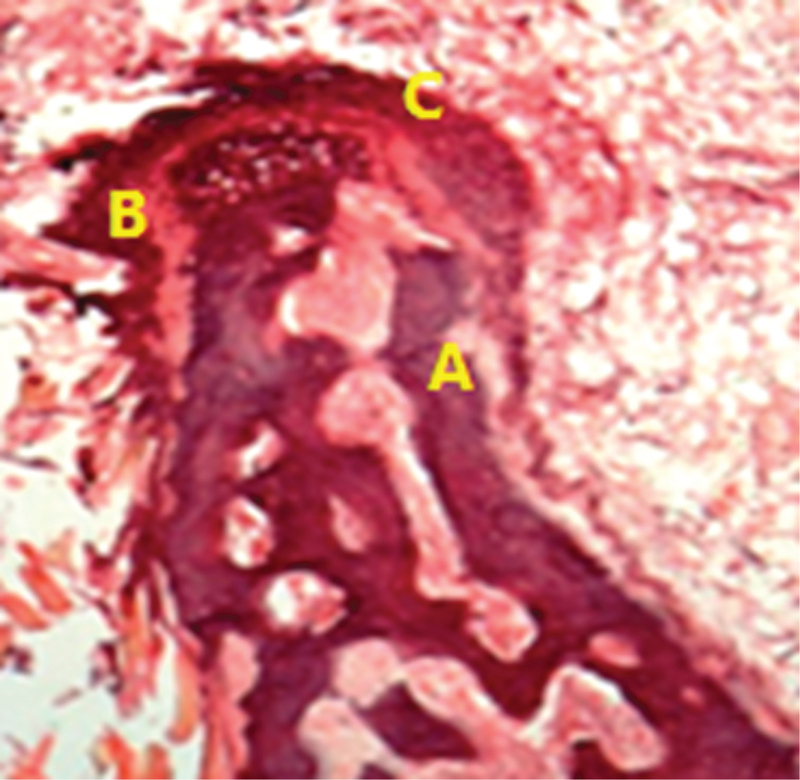 Two animals with condensed thickened fibrous tissue [n = 2] (Figure 1 and Figure 2). 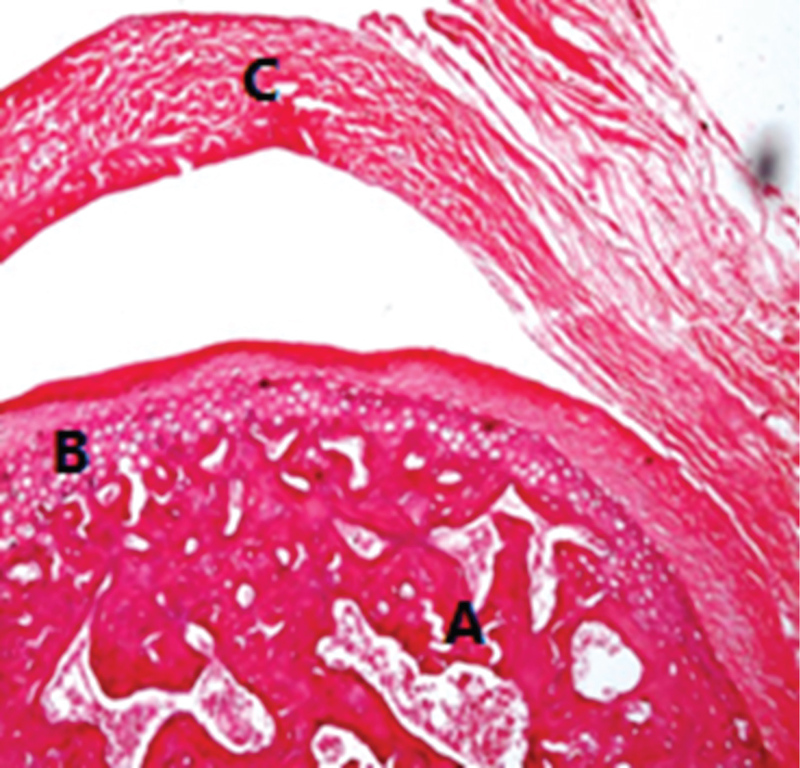 The bone marrow spaces of the condyle head showed regeneration and normal histology in five animals [n = 5]. 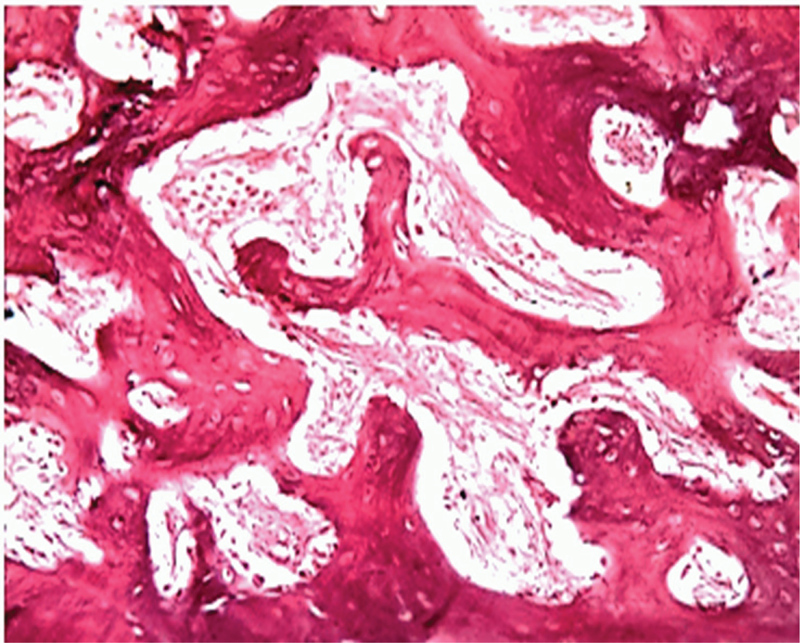 New bone formation documented by the presence of reversal lines in all histological sections. The fibrous layer of the condyle head, temporal bone, and the articular disc appeared normal in thickness except for one animal with a slightly thickened fibrous layer covering the condyle head (Figure 3). The marrow spaces in both condyle head and temporal bone showed widening. 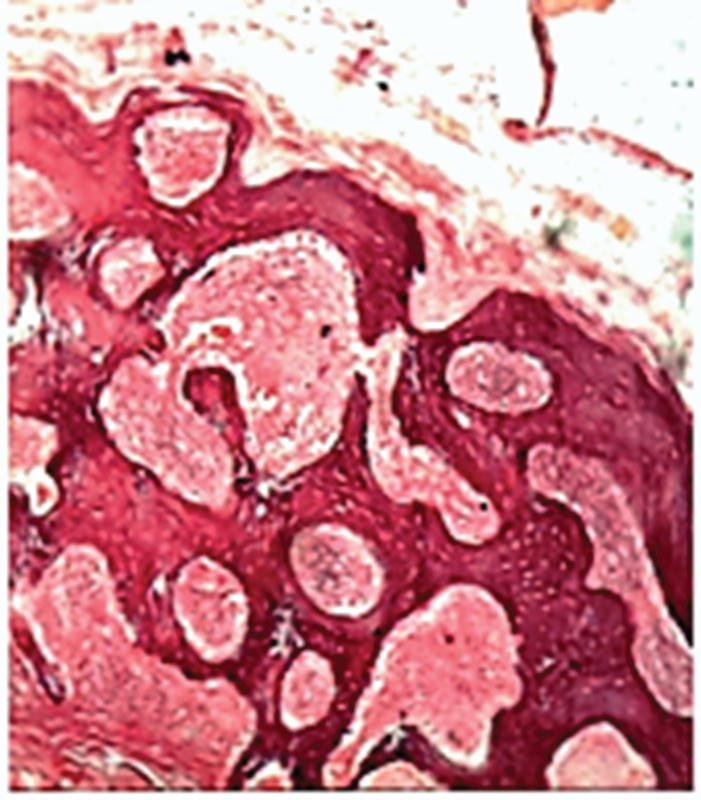 The hyaline cartilage of the condyle appeared with apoptosis. 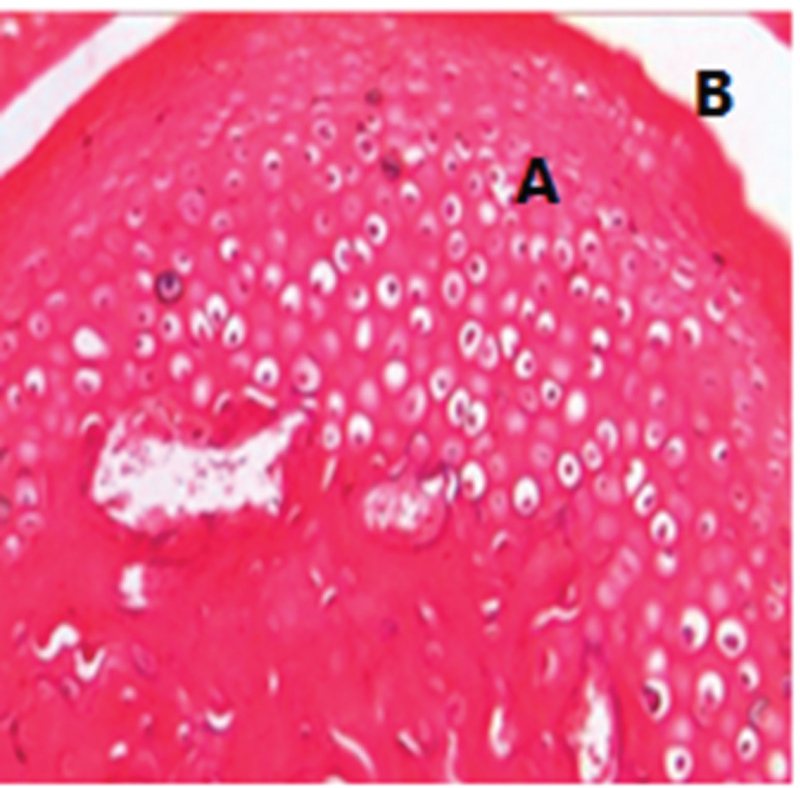 The covering fibrous layer of the condyle head showed partial degeneration, however, no changes detected in the articular disc in all animals participating in the current subgroup (Figure 4 and Figure 5). 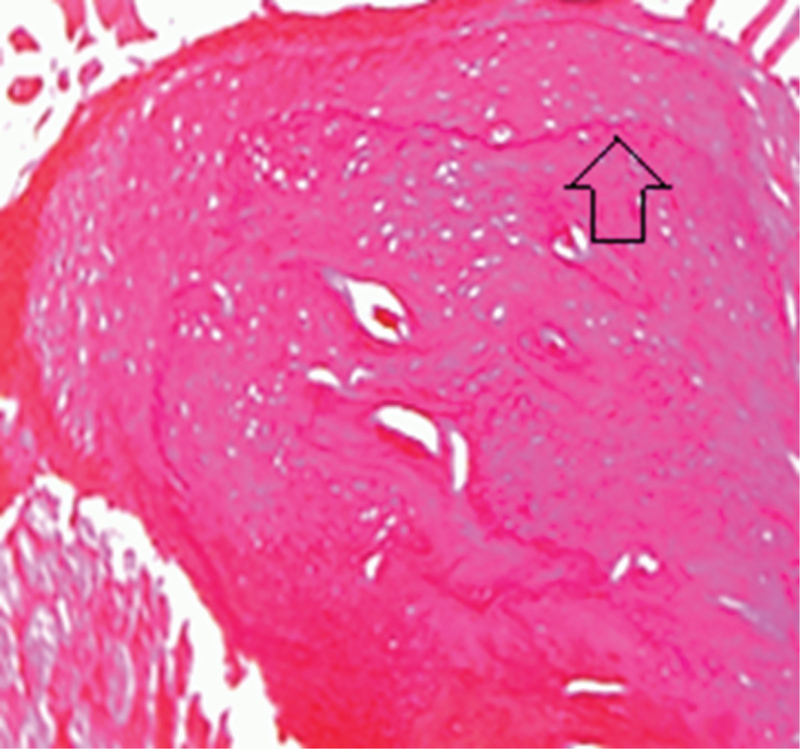 In all animals of the subgroup, the bone marrow spaces still wide both in the condyle and temporal bone, furthermore decrease in thickness of hyaline cartilage covering the condyle show signs of apoptosis and thinning of fibrous tissue layer, while the articular disc is normal (Figure 6). In all animals of the subgroup, Widening of the bone marrow spaces in the condylar head and temporal bone. 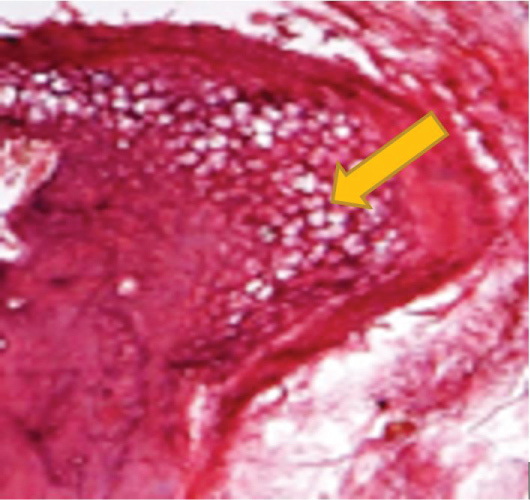 Bone marrow showed inflammatory cell invasion and fatty degeneration. 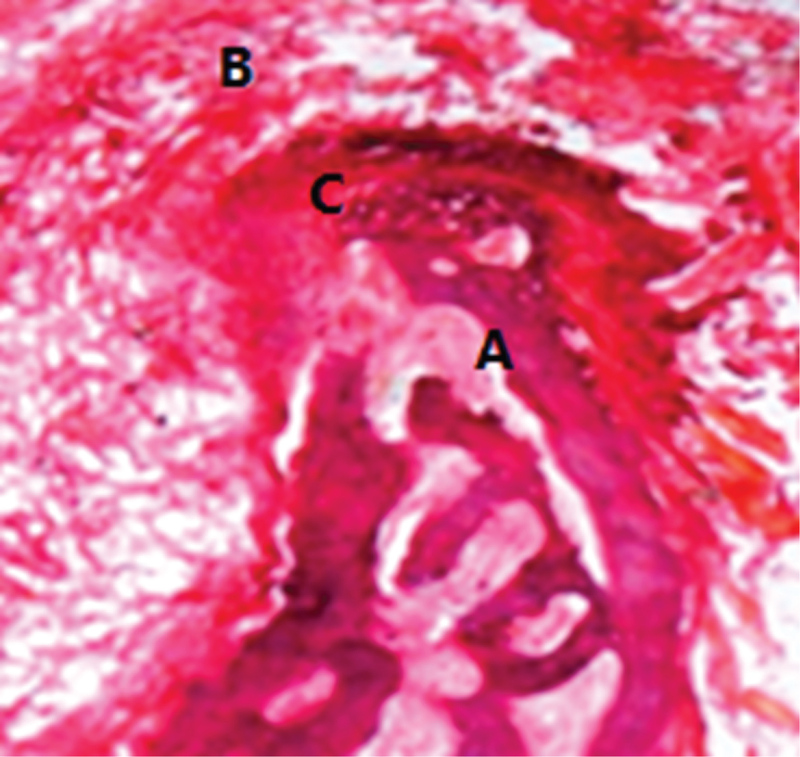 Degeneration of hyaline cartilage and tearing of fibrous layer with thinning of the articular disc (Figure 7 and Figure 8). Bone resorption of the condylar head noticed with surface erosion and microcyst formation. 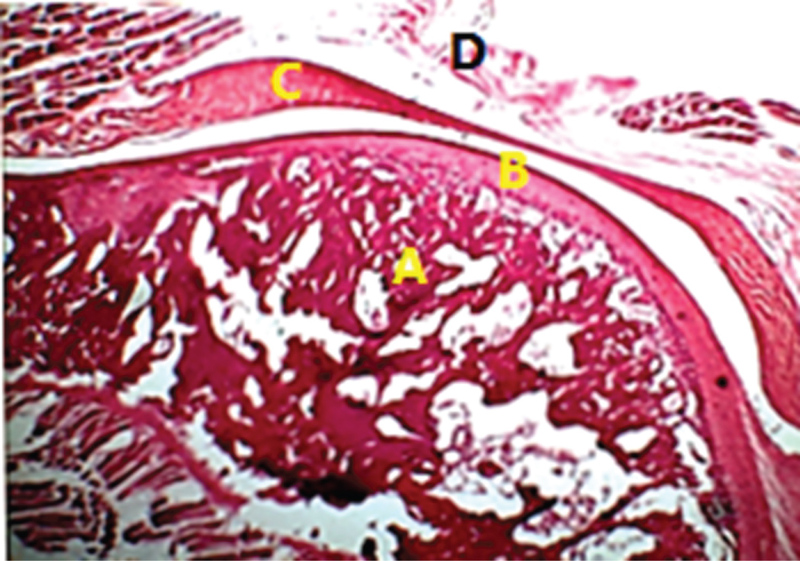 The fibrous layer and hyaline cartilage of the condylar head completely lost in five animals [n = 5] (Figure 9 and Figure 10), one animal showed maintained hyaline cartilage. 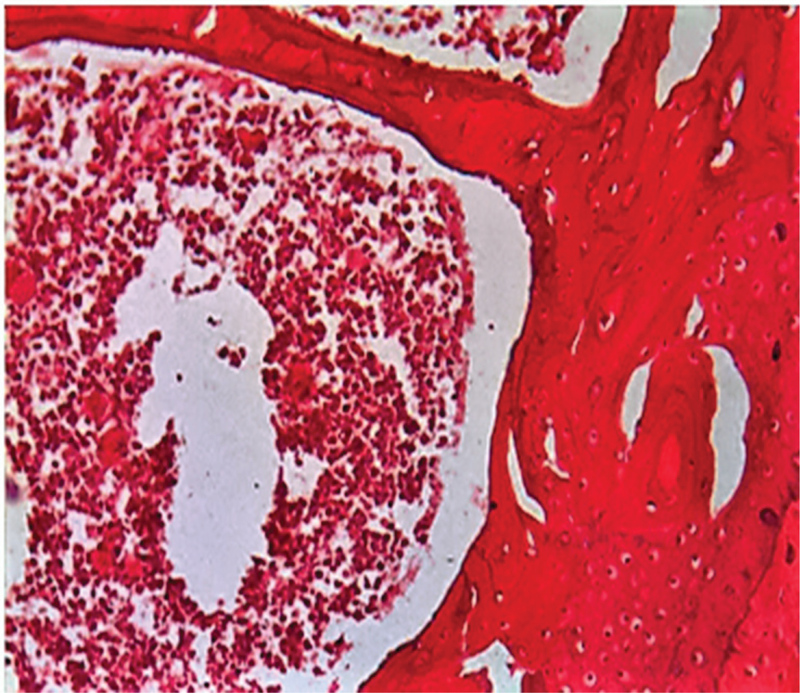 The wide bone marrow spaces still in both the condyle and temporal bone with inflammatory cell invasion, mixed fibrous and fatty degeneration of marrow spaces detected in all animals (Figure 11). Although, there is a controversy about the effect of intra-articular injection of corticosteroids on both bone and soft tissues of the joint histopathological studies of this topic is limited. This study was conducted on the temporomandibular joint in its normal healthy state to study the effect of corticosteroids on the joint structure in relation to the number of corticosteroid injections used. The animal model is necessary for a histopathologic examination of TMJ changes. Rats are selected because they have condylar translation movements similar to the human condyle. The dosage used in the study [4 mg of the active drug] determined according to the manufacturer directions for injection of small joints. In the current study three injections selected according to Arroll and Goodyear  protocol, who found that the number of injections required to get the improvement of joint symptoms between one to three injections. Thinning of the articular cartilage explained that intra-articular hydrocortisone has a direct inhibitory effect which concomitant with the results of a study by Hauser  who mentioned that the rate of the cartilage protein synthesis affected by corticosteroids given by intra-articular route. In contrary to previous studies that reported, even one injection into the temporomandibular joint (TMJ) showed the tremendous destruction of the articular cartilage and underlying bone, furthermore, the cartilage remained biochemically and metabolically impaired. Our findings detected that any deviations corrected by body regenerative mechanism and no harm from single injection on articular structures. Our findings reveal that the order of changes in animal joints due to intra-articular steroids injection as follows; the bone of the condylar head and the temporal bone was the first structures affected, followed by the fibrous layer covering the condyle. The hyaline cartilage and the articular disc with the retro-discal tissue didn’t affect up to three injections. In spite of long-term treatment of TMJ with repeated steroid injections appears to be clinically effective for the relief of symptoms of the disease [as pain and range of motion] but this is not enough for acceptance of the treatment when weighing benefits against harm. The clinical improvement after the intra-articular corticosteroid injection documented in the short term assessment, however, these effects declined gradually two weeks after injection leaving irreversible damage to the joint structure. Based on the results of the current study the bone structures are the most sensitive to intra-articular injection, however, the deleterious effect of corticosteroids on the TMJ healthy bony structures could be avoided with the use of single intra-articular injection. Further studies recommended using longer injections intervals that may give a chance for joint structural regeneration. Alomar X, Medrano J, Cabratosa J, Clavero JA, Lorente M, et al. (2007) Anatomy of the temporomandibular joint. Semin Ultrasound CT MR 28: 170-183. Abubaker AO (2006) TMJ arthritis: An Evidence-based Approach to Diagnosis and Treatment. In: Laskin, Daniel M, Greene, Charles S, Hylander, et al. TMDs. Quintessence Publishing Co, Hanover Park, USA, 229-248. Tanaka E, Detamore MS, Mercuri LG (2008) Degenerative disorders of the temporomandibular joint: Etiology, diagnosis, and treatment. J Dent Res 87: 296-307. Dávila-Parrilla A, Santaella-Santé B, Otero-López A (2015) Does injection site matter? A randomized controlled trial to evaluate different entry site efficacy of knee intra-articular injections. Bol Asoc Med P R 107: 78-81. Fredriksson L, Alstergren P, Kopp S (2005) Serotonergic mechanisms influence the response to glucocorticoid treatment in TMJ arthritis. Mediators Inflamm 4: 194-201. Lavelle W, Lavelle ED, Lavelle L (2007) Intra-articular injections. Anesthesiol Clin 25: 853-862. David Andrew Rice, Peter John McNair, Gwyn Nancy Lewis, Nicola Dalbeth (2015) The effects of joint aspiration and intra-articular corticosteroid injection on flexion reflex excitability, quadriceps strength and pain in individuals with knee synovitis: A prospective observational study. Arthritis Res Ther 17: 191. Peterson C, Hodler J (2011) Adverse events from diagnostic and therapeutic joint injections: A literature review. Skeletal Radiol 40: 5-12. Puntita Siengdee, Tiwaporn Radeerom, Similan Kuanoon, Thippaporn Euppayo, Waranee Pradit, et al. (2015) Effects of corticosteroids and their combinations with hyaluronanon on the biochemical properties of porcine cartilage explants. BMC Vet Res 11: 298. El-Hakim IE, Abdel-Hamid IS, Bader A (2005) Temporomandibular joint response to intraarticular dexamethason injection following mechanical arthropathy: A histological study in rats. 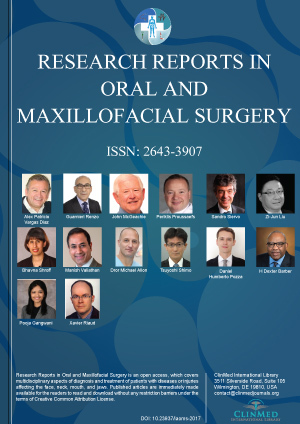 Int J Oral Maxillofac Surg 34: 305-310. Haddad IK (2000) Temporomandibular joint osteoarthrosis. Histopathological study of the effects of intra-articular injection of triamcinolone acetonide. Saudi Med J 21: 674-679. Schindler C, Paessler L, Eckelt U, Kirch W (2005) Severe temporomandibular dysfunction and joint destruction after intra-articular injection of triamcinolone. J Oral Pathol Med 34: 184-186. Fredriksson L, Alstergren P, Kopp S (2006) Tumor necrosis factor-alpha in temporomandibular joint synovial fluid predicts treatment effects on pain by intra-articular glucocorticoid treatment. Mediators Inflamm 2006: 59425. Chloe Wernecke, Hillary J Braun, Jason L Dragoo (2015) The effect of intra-articular corticosteroids on articular cartilage: A systematic review. Orthop J Sports Med 3. Ringold S, Torgerson TR, Egbert MA, Wallace CA (2008) Intraarticular corticosteroid injections of the temporomandibular joint in juvenile idiopathic arthritis. J Rheumatol 35: 1157-1164. Mountziaris PM, Kramer PR, Mikos AG (2009) Emerging intra-articular drug delivery systems for the temporomandibular joint. Methods 47: 134-140. Brinks A, Koes BW, Volkers ACW, Verhaar JAN, Sita MA Bierma-Zeinstra SMA (2010) Adverse effects of extra-articular corticosteroid Injections: A systematic review. BMC Musculoskeletal Disorders 11: 206-216. Peter Stoustrup, Kasper Dahl Kristensen, Annelise Küseler, Thomas Klit Pedersen, Troels Herlin (2015) Temporomandibular joint steroid injections in patients with juvenile idiopathic arthritis: An observational pilot study on the long-term effect on signs and symptoms. Pediatr Rheumatol Online J 13: 62. Arroll B, Goodyear-Smith F (2004) Corticosteroid injections for osteoarthritis of the knee: Meta-analysis. Primary Care 328: 869. Hauser RA (2009) The deterioration of articular cartilage in osteoarthritis by corticosteroid injections. Journal of Prolotherapy 1: 107-123. Atef Abd El Hameed Fouda, Department of Oral and Maxillofacial Surgery, Faculty of Oral and Dental Medicine, Cairo University, Giza, Egypt. © 2018 Fouda AA. This is an open-access article distributed under the terms of the Creative Commons Attribution License, which permits unrestricted use, distribution, and reproduction in any medium, provided the original author and source are credited.